My washing workload has exploded since I had kids. I think I spend more time in the laundry these days than I do cooking a nutritious meal my little fusspots won’t eat. Now because my two boys aged two and four are well, grubby little boys, it’s inevitable that whatever they’ve been playing with ends up on their clothes and sometimes our soft furnishings, too. Grrr. While I usually just spray their clothes before washing them with a little stain remover and hope for the best, this doesn’t always do the job. Some stains need secret tricks, I’ve discovered. Here’s some sneaky ways to get rid of some of the most common kid stains. 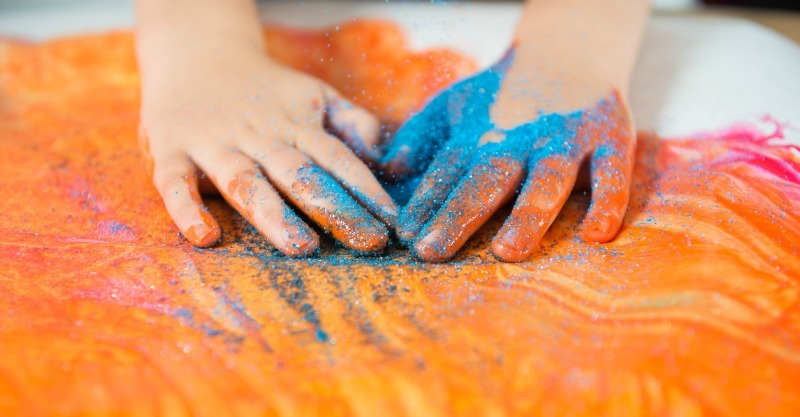 If your home looks like a fairy has exploded, here’s what to do: Don’t shake your child’s clothes as the sparkles will only spread further! Lay any glittery clothes on a towel and spray them with hairspray. Allow the hairspray to dry until it’s hard and then wash clothes as usual (but not with other non-glittered items) in the machine. Crayon stains can be as stubborn as your toddler. To get rid of them you’ll need a to place the crayon-stained clothes on a wad of paper towel and then spray the stain with WD40. Let this sit for five minutes and then flip the clothing over and spray again. Rinse and wash as usual. If the lid of your toddler’s sippy cup has popped off and she’s spilt juice all over her, no worries. A little soak in cold water for half an hour, followed by a sponging of white vinegar will nix the stain. Then wash as normal. Uh-oh! Ha someone gone all Picasso on you with a felt tip marker they found? Never fear! Apply some paper towel to the stain and then dab it with rubbing alcohol. Continue sponging the spot with alcohol to transfer as much ink as possible, frequently changing the paper towels underneath. Then rinse thoroughly and toss in the washing machine. Kids spent the afternoon rolling down a grass hill? Forget scrubbing furiously at those green stains. Simply apply some liquid laundry detergent (with enzymes), let it sit for five minutes and then toss the garment into the wash on the hottest setting the care instructions will allow. If your tot has gotten his chubby little mitts on a Biro and has done some ‘artwork’ on your throw cushions, remove the covers, and rot some milk in the sun until solids are formed. Then place the solids on the stain and leave until the ink starts to rise up into them. Wash the milk solids out using detergent and water and toss the covers into the washing machine. If your little one meets you at the daycare gate looking like he’s been the canvas, not the paper he was supposed to be painting on, fear not. These are usually washable water-based paints anyway, but here’s the trick for treating them if they’ve dried on: Brush off as much of the dried paint stain as possible. Next, apply a soapy water mix and scrape some more. Then, work a detergent mix into the stain, using your fingers to gently rub it away. If the paint stain remains, apply a touch of nail polish remover on an absorbent cloth and blot. Then rinse and wash as usual. Kids had fun in the mud kitchen making delicious but messy mud pies? Rather than apply moisture to these muddy stains, wait for them to dry and then scrap or shake the dirt off. Next, spray the stain with stain remover and wash the garment as usual. If your little ones have helped themselves to some tommy sauce at dinner, chances are you have more than a few red stains on their clothes to deal with. To make them disappear, simply scrap off the excess, then spray the area with a mixture of dishwashing detergent and water. Soak the clothes in warm water. Next place a few drops of white vinegar on the stain to get rid of any remaining marks. 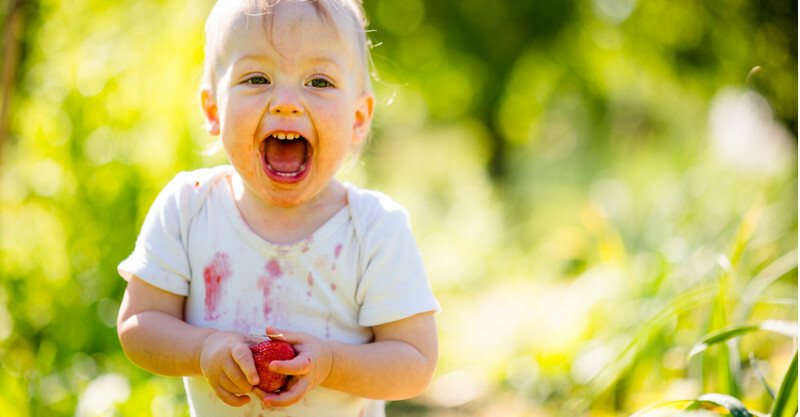 Treat with an enzyme detergent, and wash.
Berries are a nutritious and yummy snack for little ones but they can be messy. Scrape away as much of the berry stain as you can before washing clothes as per usual. Next, hang on the line to let the sun’s UV rays do it’s magic. If the stain remains, try sponging it with lemon juice or rub a lemon slice over the stain. Flush with water. Blot the moisture up and leave to dry.